If you want to have a green Christmas, start with the tree. 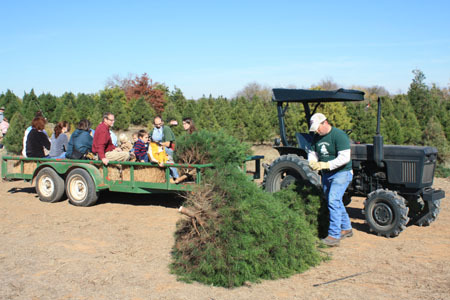 There’s no lack of Lone Star tree farmers who work year round to supply conifers for seasonal decorations. Not only do real Christmas trees smell like the season should, but as they grow they provide habitat for wildlife and remove dust and pollen from the air. If discarded after the holiday, they can be recycled and composted or used as barriers to prevent sand and soil erosion. 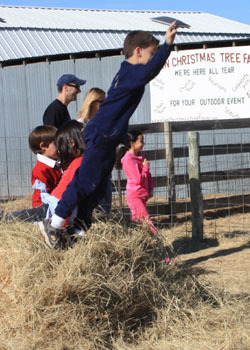 More than 120 Texas farmers grow, sell, and promote local Christmas trees, with most Christmas tree farms scattered throughout the central and eastern sections. In addition to providing choose-and-cut opportunities (as well as precut trees), many offer additional activities such as hayrides, gift stores, petting zoos, tours, Santa Claus visits, bonfires, games, and picnic areas. A visit can take an hour or become a day-long family outing. Virginia Pine is the most widely planted southern Christmas tree, but Afghan Pine, Eastern Red Cedar, and Carolina Sapphire each have distinctive characteristics that appeal to certain buyers. Introduction of the Leyland Cypress, a hybrid that outlasts other varieties without leaving needles in the carpet or triggering allergies (it doesn’t have a scent), has been a boon to the industry in Texas. Marc and Twyla Nash bought the farm in 2002 from her parents, who sold Christmas trees as a retirement venture. Since taking over, the Nashes have expanded the farm into a year-round agri-tourism business with additional and activities that give it a park-like atmosphere. There’s a playground and haystacks for kids to jump on, grilled sausage from Meyer’s Elgin Smokehouse, and trailer rides to the fields of tangy pines for that all-important selection (saws are provided). The Christmas Cottage, a 75-year-old house moved to the farm from Austin in 2006, was remodeled to become the gift shop; children can also shop at the barn store where most items are under $5.00. “We really want families to come out and enjoy each other,” Twyla says. Cutting the tree takes a whole-body effort. 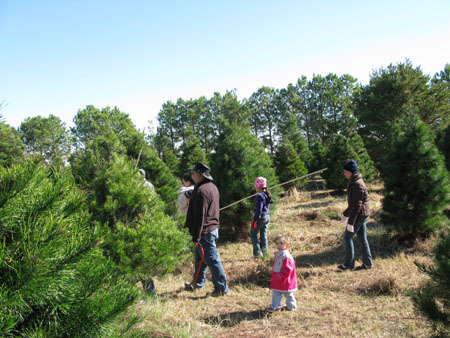 The largest farm in the state, Elgin Christmas Tree Farm has more than 35,000 trees in the ground. Each year they designate one section of four-year-old trees for harvest. Seasonal hires in red shirts and orange gloveshustle into action whenever a trailer loaded with trees arrives at their station—putting trees in shaker machines and wrapping mesh around the trees for easy transport. For Mike and Beth Walterscheidt, Evergreen Farms near Elgin started as a hobby and grew into a business. “People thank us for having the farm,” Beth says. “They are always in good spirits when they come here, and that makes us happy, too.” No wonder–campfires, petting zoo, hayrides, an assortments of wreaths and other living decorations, pine cone painting, and holiday music on the pavilion attract families who return year after year for the special experience of choosing and cutting their own tree. 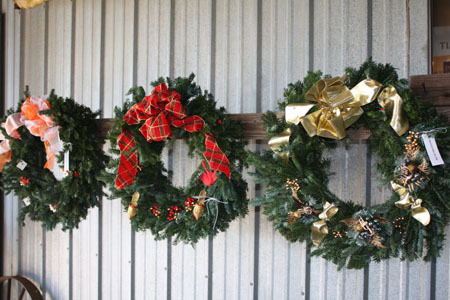 Lovely handmade wreaths are also for sale at Evergreen Farms. recognition numerous times for the quality of its trees and the total experience it provides. Update: Both of these farms are open for business and provide a variety of fun holiday activities despite the drought that Texas has experienced this year. 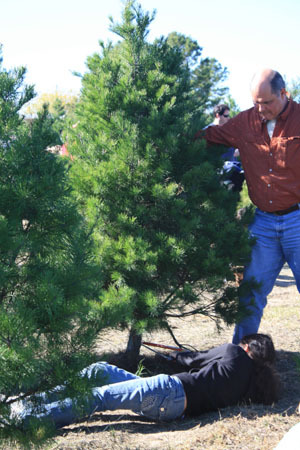 You can still cut your own tree at Elgin Christmas Tree Farm; however, Evergreen Farms is letting their trees grow another year and will be shipping in trees that visitors may choose.